If you’re on a ketogenic diet, you might notice that some of the salad get high in carbs very quickly. So, you might need to start adjusting your recipes so you stay under the net carb limit. Anyway, salads are very nutritious, healthy and easy to make. Therefore, it only makes sense to incorporate them into your diet. 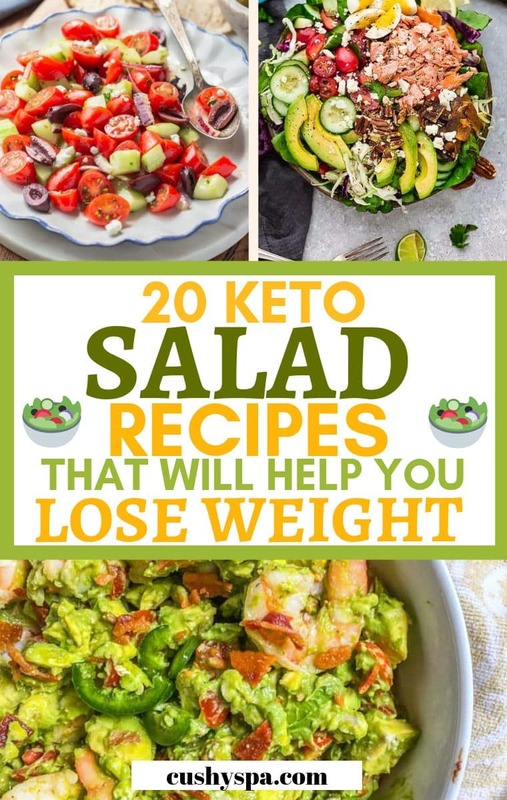 Today I’m sharing multiple ketogenic salad recipes that might give you a little bit more inspiration for your own recipes. Most of these salads are very easy to make. Some of them are better for lunch at work, others – for fancier dinners. The great thing about salads is that you can have them as a meal or as a side. It’s all up to you! I’ve also included nutritional information, so you know exactly how many carbs you’re consuming. 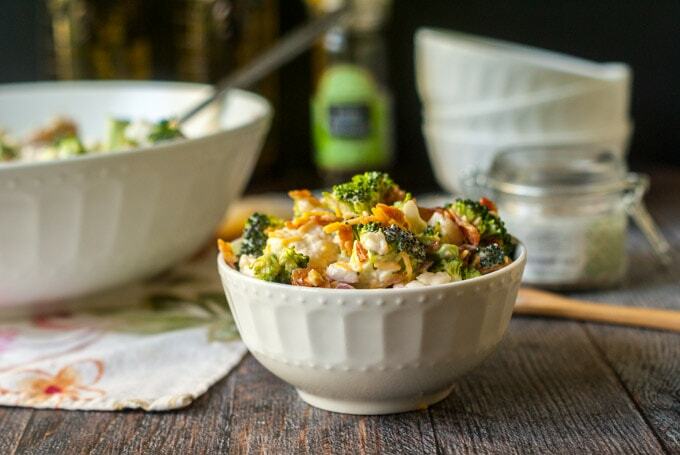 If you’re looking for a sweet, creamy yet crunchy salad, broccoli cauliflower salad is the way to go. While sweetness in the salad usually means that it has sugar, that’s not the case here. Instead of regular sugar to sweeten it up, I recommend using erythritol. This is the healthiest type of sweetener that won’t affect your gut lining, unlike other sweeteners do. It’s truly one of those filling salads that you can eat on its own and not worry about having the main dish. Great for both dinner and lunch time! 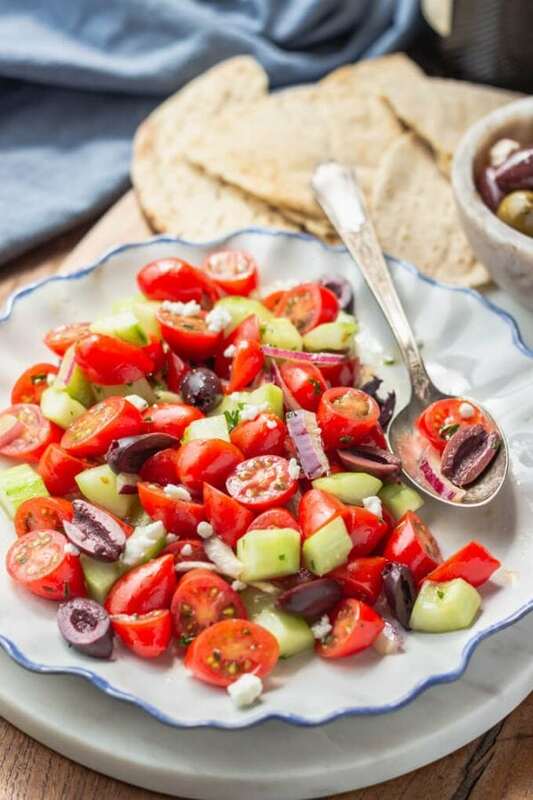 This is a little twist on the original Greek salad recipe that you must try. Especially if the Greek salad is something you love. Unlike the previous salad, this one is great as a side dish. So, get some of your favorite fish since this salad goes perfectly with it. What I love about salad is the number of healthy fats that come from avocados and olives. 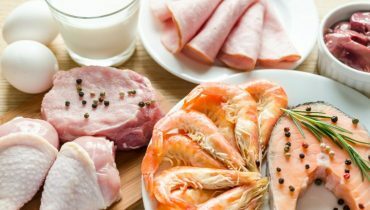 However, it’s still high in protein! It’s a great salad for a refreshing summer lunch or dinner. Especially when it’s hot outside! If you’re a fan of Big Macs but cannot quite afford eating so unhealthy, here is a much lighter (and healthier option) you should try. 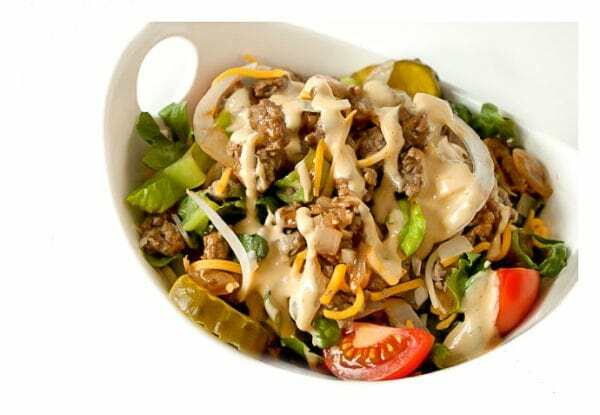 So, if it’s one of those days when you just crave for a burger, it’s a great time to try this salad. It’s very filling, full of proteins and low in carbs. As you’d expect, it contains a bit of everything that you would find in the Big Mac. Pickles, lettuce, tomatoes, and even lean ground beef. You’ll need ketchup too. Make sure the ketchup you use is low in carbs. If you’re a fan of Heinz, this particular product is much lower in sugar contents. This is an easy lunch salad that’s made out of 5 ingredients. It’s simple, nutritious and delicious. 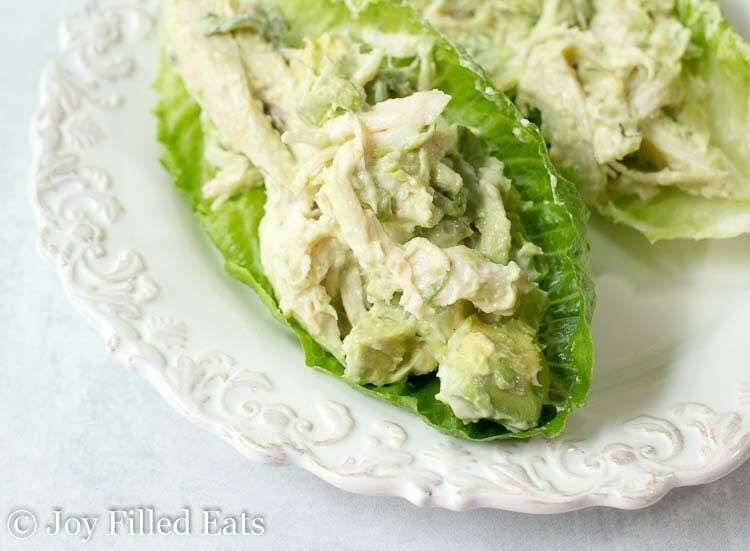 All you’re going to need is shredded chicken, avocado, mayo, fresh basil, lemon zest, and lettuce leaves. Here is a good mayonnaise with no artificial flavors. It’s egg-free, dairy-free, non-GMO and has only 1g of carbs per tablespoon. Definitely worth a try. The combination of chicken, avocados and mayo simple melts in your mouth. Also, the lettuce leaves give it a little bit of very much needed crunchiness. This salad is slightly fancier, and you could probably serve it when you have your friends over. 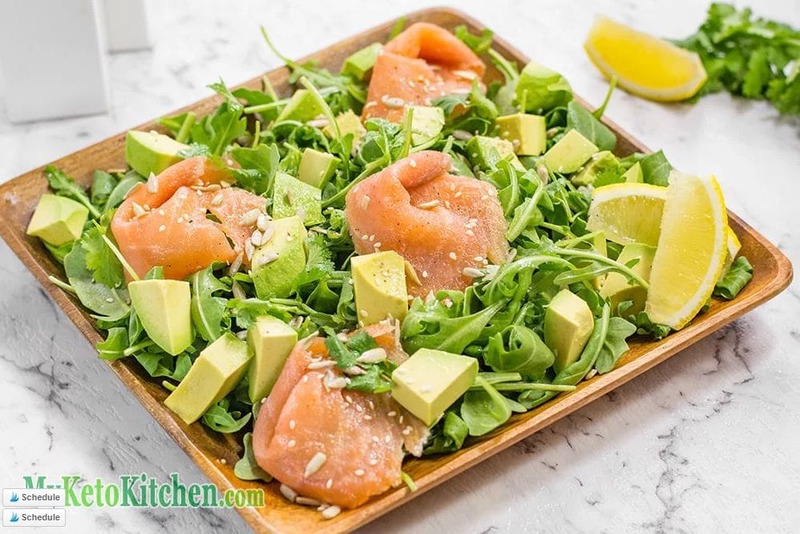 The combination of avocado and salmon is simply delicious. The salad is loaded with Omega 3 fatty acids which are essential for hormonal balance, mental health, and heart health. 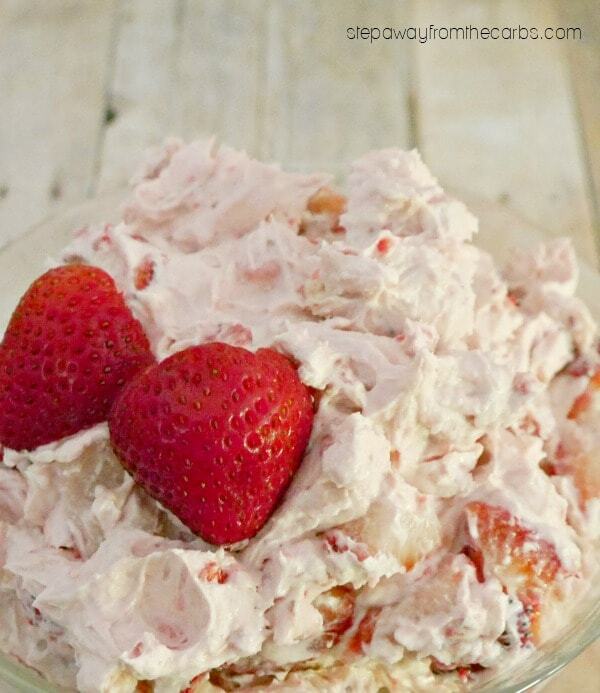 It’s also fairly simple to make and is great for summertime. If you want something more refreshing yet nutritious, this is the salad you want to have. Also, the softer the avocado you cut in, the better the salad! So, do have that in mind. This Asian salad is one of a kind. It’s very high in proteins and has loads of fiber. It’s great for lunch since it doesn’t make you feel all heavy and sleepy. If you’re a fan of Asian cuisine and love the flavors of garlic, ginger, it’s truly a great salad to try. 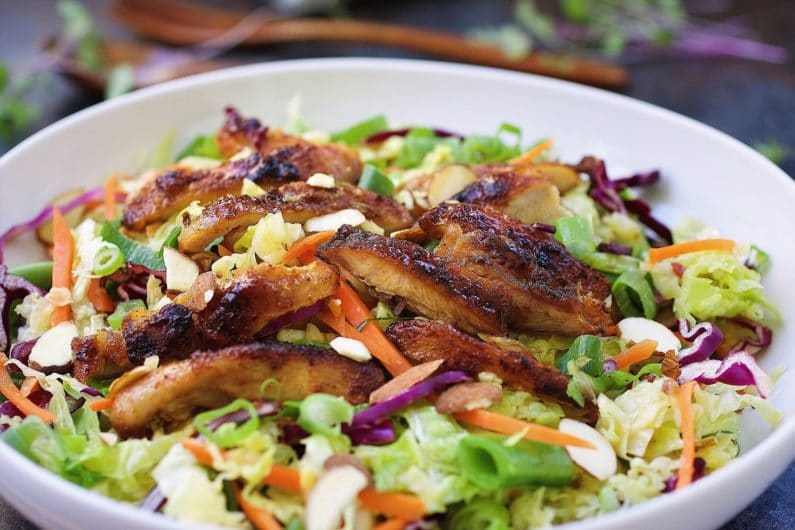 Cabbage salad all by itself can be boring but the chicken makes it more interesting. Also, the dressing is really the key here. So, make sure you get the right products for it. Hey, if you’re a simple person like me and love your tomatoes and cucumbers, this salad is just for you. 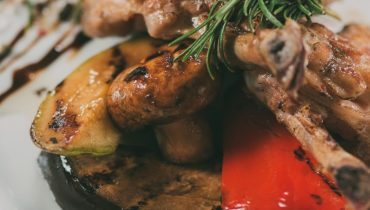 Mediterranean cuisine is known for being one of the healthiest out there. Here is a great Mediterranean diet review was written by Harvard University. Check it out, if you’re interested! Coming back to the salad, it’s very refreshing and fairly simple. 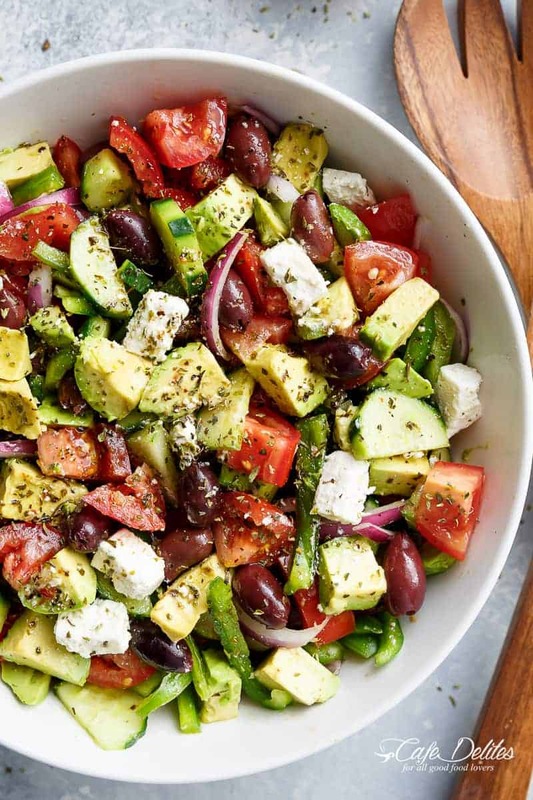 It’s similar to the Greek salad I’ve mentioned before, but there are a few variations of it that can completely transform the taste of it. Feel free to add garlic, mint, parsley or basil to completely transform the flavors. Also, let’s be honest – the salad is very refreshing, great as a side dish in the summers. Moreover, it’s packed with healthy fats and fiber – which is essential for gut health. You’ve probably already noticed that a lot of these ketogenic salads contain avocado. Why is that? Avocados are low in carbs and high in fiber, which is very important when you’re on the ketogenic diet. The truth is, when you start cutting on carbs, often times you cut on fiber too. Thus, you might have digestion issues because fiber encourages bowel movements that are so important to get the nutrients out of the food. So, avocados are a great option when you’re on the keto diet. They’re very high in healthy fats too which provide you with long-term energy. 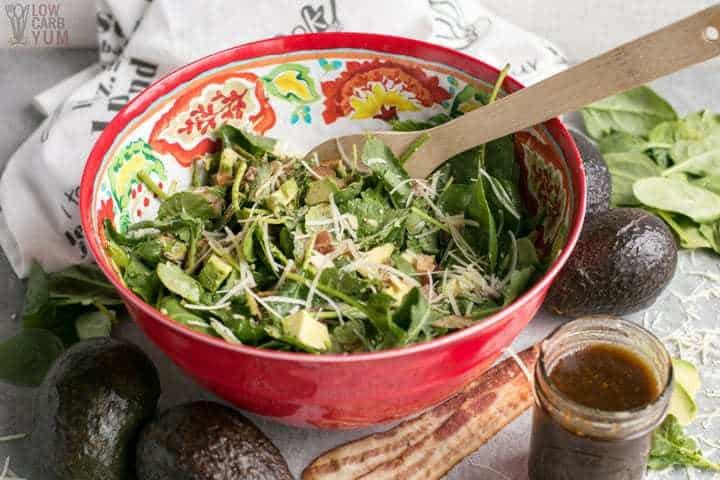 In this particular salad, the avocado plays an essential role. 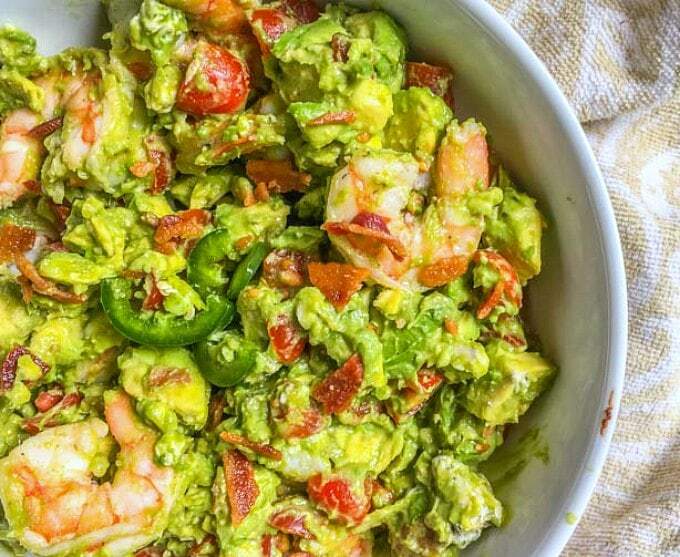 It moistens up the whole salad, beautifully coats shrimps, tomatoes, and bacon. 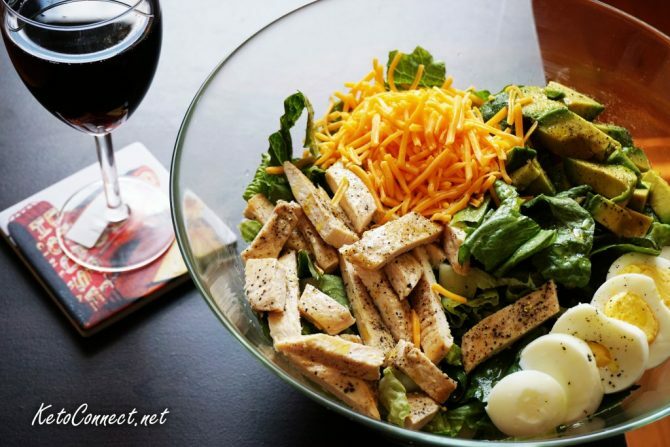 The salad will melt in your mouth and fill you up for the whole day. So, definitely a great option for a ketogenic lunch meal! This is a quick to make, very nutritious and delicious salad. It’s very high in proteins and fats which come from chicken, bacon, avocado, cheddar, and egg. It’s great if you want something quick and have some cooked chicken in your fridge. Perfect for lunch. Use sealable containers like these ones here to store cooked chicken and boiled eggs. These two are great for meal prep. You can keep them in the fridge for up to 3-4 days and use them in the salad. They’ll stay perfectly fine and taste delicious. So, this is definitely an easy salad that you can make whenever you have no time. The nutritious benefits are obvious too! This is another simple salad. Cutting all your favorite veggies and making sure you have enough onion is really the key to making it taste delicious. 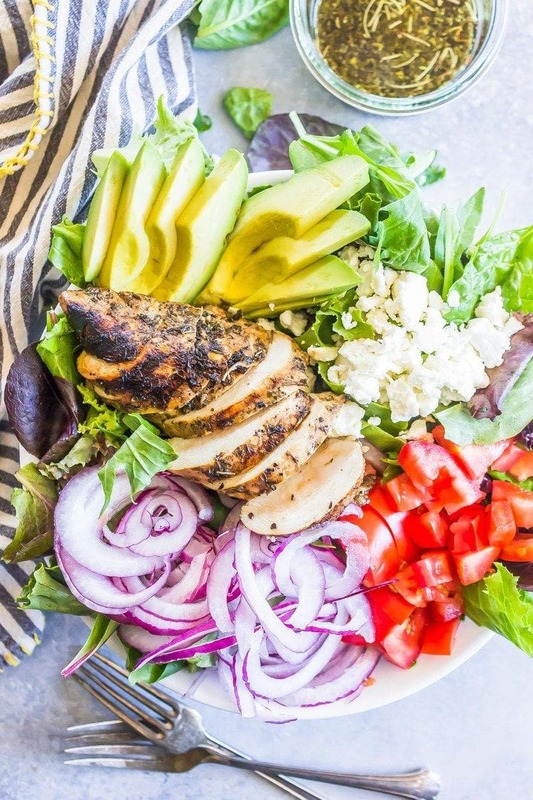 Try the dressing from the recipe because it goes well with chicken and avocados! It transforms the way each product tastes and makes the whole salad a little bit more special. As you can imagine, this is great for bringing to work or for a quick lunch. Salads really don’t have to be complicated to taste amazing. Looking for something for a nice ketogenic brunch, this salad is pretty good for that. A combination of bacon and eggs fills you up quite a bit. Also, mayo plays a crucial role in this recipe. So, make sure the mayo you use is the healthier one. Like I’ve mentioned before, this mayo is a healthier option that you can try. The salad will literally melt in your mouth by the way! This is a super nutritious salad both high in fats and proteins. Salmon is high in vitamin B12 which essential for cell metabolism. Generally speaking, most fish are high in omega-3 fatty acids and group B vitamins which are very important for brain functioning. So, do yourself a favor and incorporate more fish into your diet. This salad offers a great mix of vegetables, so you can play around with the combinations you love. It’s a great salad for meal prepping. Another good thing about this one is that you can spend an extra 10 minutes and make much more of it. Thus, you can eat it the next day or feed a large family! 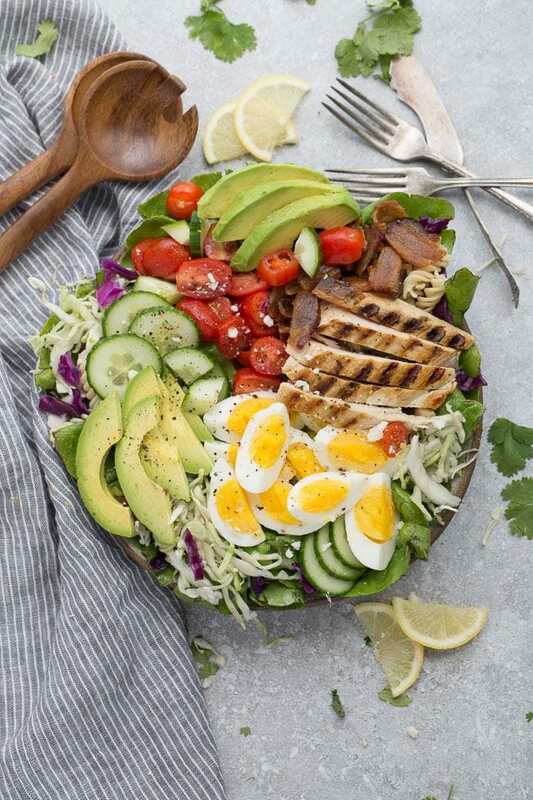 Here is another cobb salad. This one is with chicken which is a great source of proteins. Improvise and serve it for lunch. 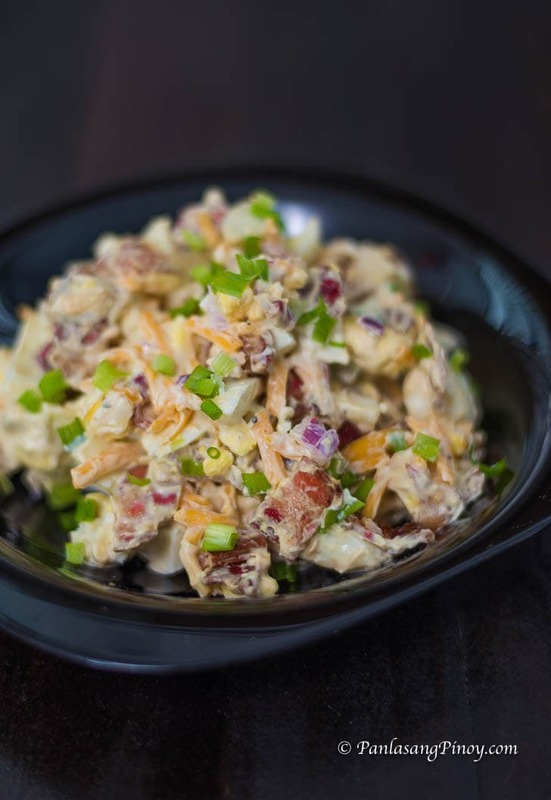 I hope this one will give you some ideas on what type of cobb salad you might like more. Like most cobb salads, this one is very easy to make, very nutritious and great for bringing to work! 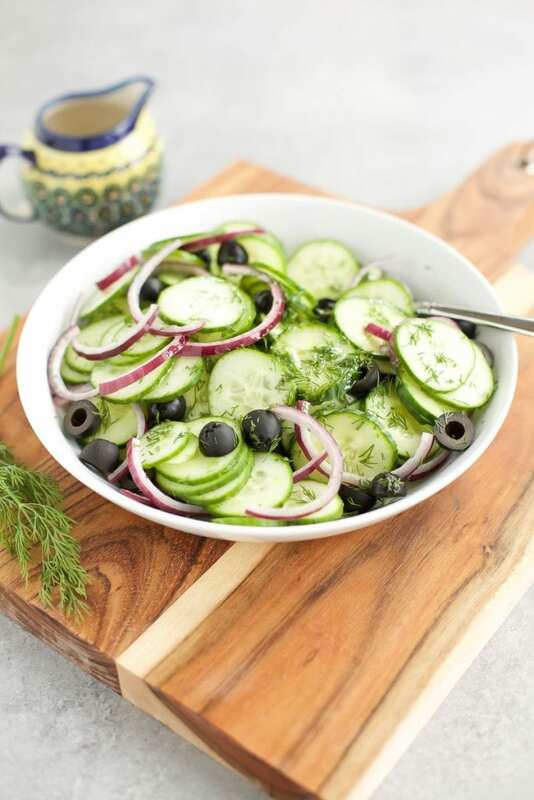 There is nothing better than a refreshing cucumber salad. Cucumbers are keto-friendly vegetables because they’re high in fiber and water. So, whenever you want a light salad on the side of your main, go for this salad. Simple but delicious. This salad takes only 5 minutes to make and you can eat it with whatever you want. It’s mostly kale. However, avocado and parmesan give it a little bit of more interesting taste. Add some almond flakes and the salad will be just right. If you have some friends over and want to serve something more interesting but have absolutely no time for it, this is the recipe to go for. Trust me, guests will love it. If you’re tired of eating cauliflower on its own with all your mains, try this recipe. 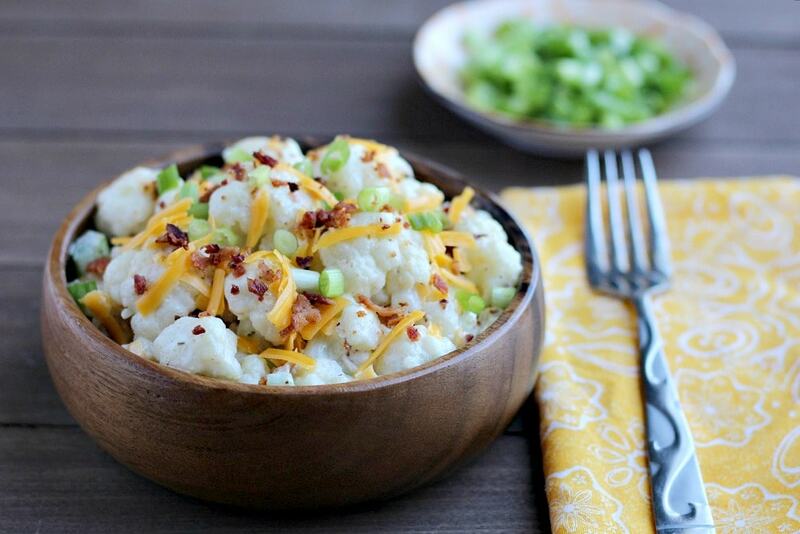 This cauliflower salad is a bit more interesting because it has bits of bacon in it. Here is a good sugar-free ranch dressing that will make the salad taste just right. Also, make sure to use mature cheddar as it tastes pretty great with bacon. This is a slightly different salad because it’s meant for a dessert. It’s absolutely delicious and, most importantly, low in carbs. For this salad recipe, you’ll need a good blender. Also, you’ll need a combination of both fresh and frozen strawberries. So, make sure it’s the season for strawberries. Otherwise, the salad won’t taste the same. I thought that this salad tastes great with sugar-free maple syrup. Lakanto is definitely the syrup I recommend. Also, if you don’t like the product you can always get a refund. 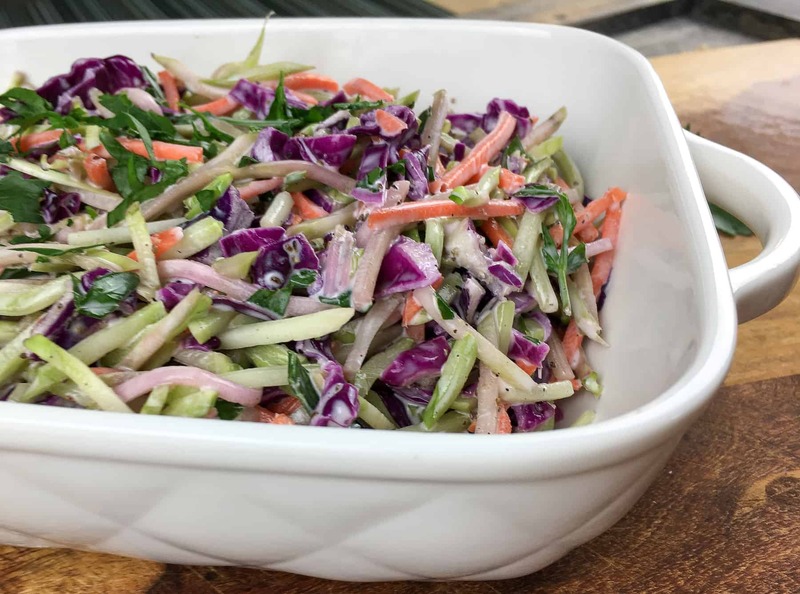 If you’re a big fan of coleslaw, try this recipe. 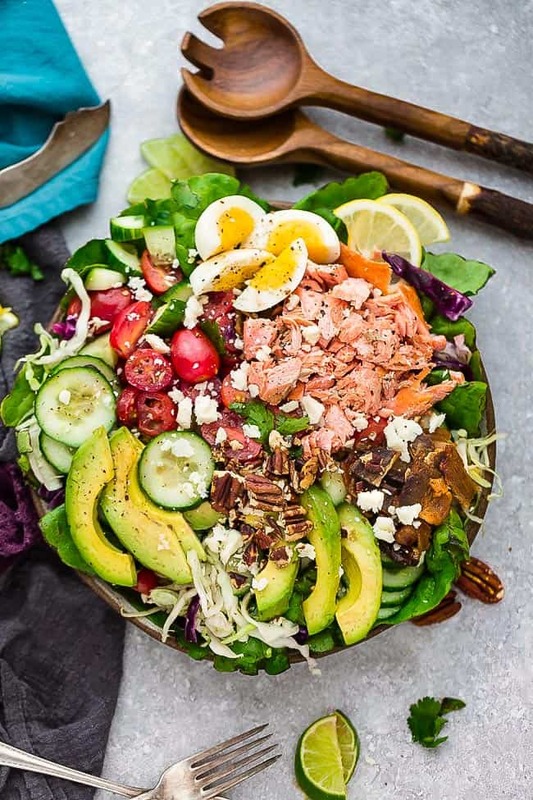 This ketogenic salad is high in fats and will you up for the whole day. The key here is avocado oil mayo, it tastes different from the regular mayo and gives the coleslaw a very much pleasant twist. Also, most coleslaw recipes contain sugar and thus are high in carbs. That’s really not the case here. So, the salad might taste slightly different from what you usually get. However, it’s still delicious and worth trying! If you do need a little bit of sweetness, just add a little bit of erythritol sweetener. This is an Asian noodle salad that’s low in carbs. The reason why it’s low in carbs is that we’re using vegetables to make them so to say ‘’noodles’’. The truth is noodles themselves don’t taste like anything. And the only thing that makes them taste like something is the sauce or the spices. 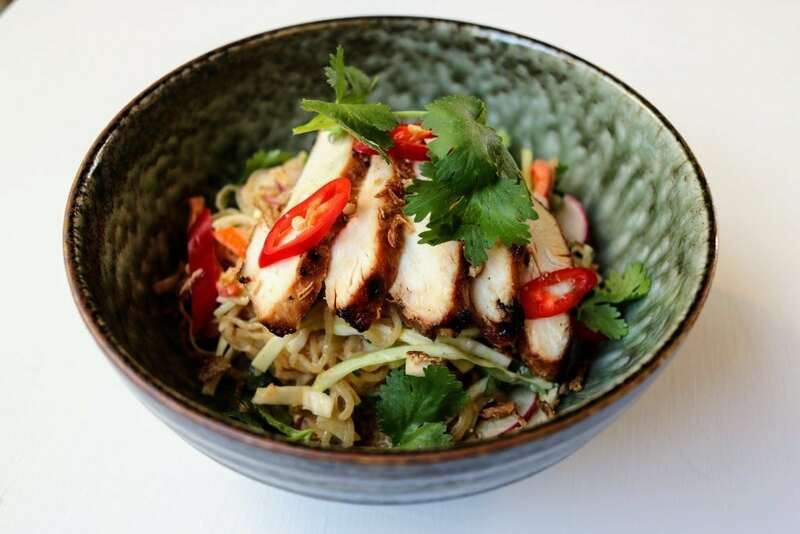 This recipe only goes to show how you can trick yourself into thinking that you’re eating carbsy noodles when all you’re doing is consuming salad! This salad recipe isn’t very simple, so I’d suggest it for a lovely dinner with friends. It’s the type of recipe that will impress many. Also, it offers a beautiful way to introduce Asian flavors into your cuisine. Moreover, you’ll need a spiral vegetable slicer for this one, otherwise, you’ll spend ages slicing all those vegetables. Here is a good, sturdy and cheap spiral slicer I recommend. Honestly, if you want to eat healthier, you need to have this one in your kitchen. 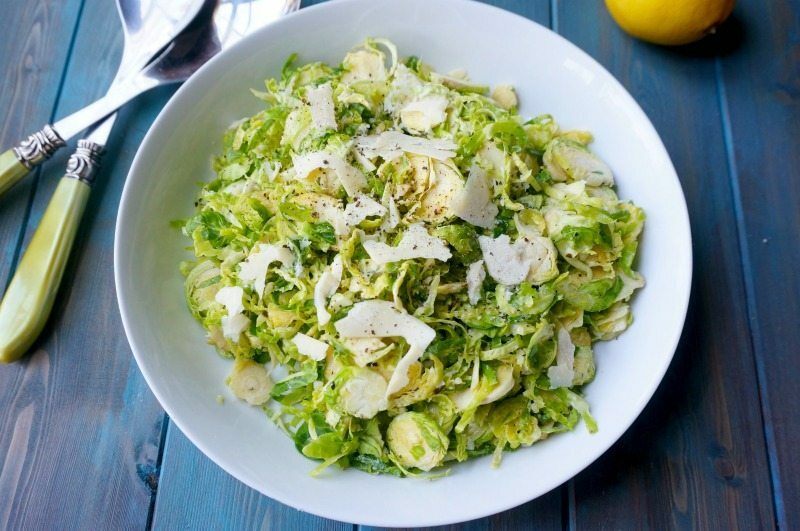 Brussels sprouts are keto-friendly, and you should add them to as many dishes as possible. It’s the sort of vegetable you can eat every day when you’re on keto. If you like lighter salads that have more greens in them but don’t taste completely boring, try this recipe. Parmesan tastes amazing with all types of greens. So, have that in mind when you’re making your own salad. The key here is fresh ingredients because a dressing won’t kill off the taste. Thus, go to your local shops, get local produce and enjoy a higher quality, a more nutritious salad that goes great with chicken. I hope you’ve enjoyed these keto salad recipes! Let me know in the comment section which recipe is your favorite. 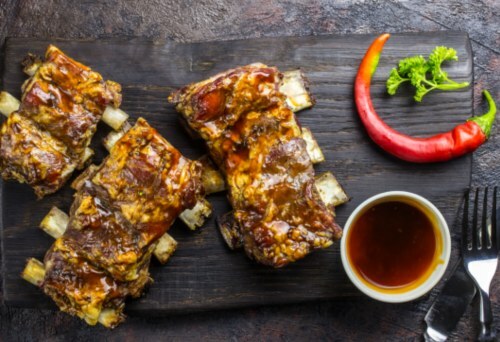 Read more about keto here! Also, if you’re a beginner to the keto diet, try this 1-week ketogenic meal plan.